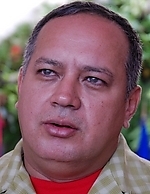 Info Diosdado Cabello Rondón (born April 15, 1963) is a Venezuelan politician. He was appointed Vice President by President Hugo Chávez January 13, 2002, replacing Adina Bastidas. As such, he was responsible to both the president and the National Assembly, and for the relations between the executive and legislative branches of the government. Diosdado Cabello was born in El Furrial, Monagas State. His background is in engineering: he has an undergraduate degree in systems engineering and a graduate degree in engineering project management from military universities. A former member of the armed forces, he was involved in Chávez's abortive coup d'état of February 1992. Following Chávez's 1998 electoral victory, he helped set up the pro-Chávez grassroots civil society organizations known as "Bolivarian Circles". On April 13, 2002, he took on the duties of the presidency on a temporary basis, replacing Pedro Carmona, head of the Venezuelan Chamber of Commerce, as interim president after Chávez was overthrown in a coup d'état. Cabello said that "I, Diosdado Cabello, am assuming the presidency until such time as the president of the republic, Hugo Chávez Frías, appears." A few hours later, Chávez was back in office. On April 28, 2002, Cabello was replaced as Vice President by José Vicente Rangel. In 2004, he was elected to a four-year term as Governor of Miranda State.